1080P, 240Hz, LED edge-lit and employing an industry-first 4-color filter (the secret extra color is yellow), Sharp's latest LE920 Series LCDs, measuring up to 68 diagonally, are the best displays Sharp can sell you. And they even support Twitter! Their price is still unannounced, and the LE920 Series won't be available until May. The sets look like big iPod touches in person, from a distance, because of the chrome rim. In the meantime (this March, actually), you can pick up an LE820/810 Series TV starting at $1800. 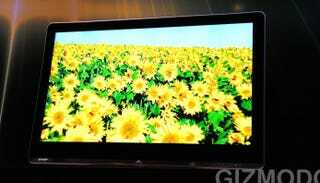 They'll range from 40 to 60 inches and keep the price down by using a normal 3-color filter and operating at 120Hz. But you should decide for yourself whether or not 240Hz is really worth the hassle. LAS VEGAS, January 6, 2010 – Sharp unveils three new AQUOS LED LCD TV series, breaking new ground in LCD technology and design. Premiering in the U.S. in early 2010, this next-generation set of UltraBrilliant Edge-lit AQUOS LED LCD TVs unveils a revolutionary technology, introducing never-before-seen colors to the TV industry. Unveiled by the company at the 2010 International Consumer Electronics Show (CES), Sharp's proprietary four-primary-color technology enables more than a trillion colors to be displayed for more sparkling golds, Caribbean blues and sunflower yellows. "As a pioneer in the LCD industry, Sharp continues to advance the technology, introducing it's first LED-backlight LCD TV on the market less than two years ago and paving the way for larger screen sizes, thin designs and Internet connectivity," said Mikio Katayama, president and chief operating officer, Sharp Corporation. "We have changed the way an LCD TV produces an image with the new four-primary-color technology, allowing us to broaden the visual experience and immerse consumers in a new world of color." This four-primary-color display employs a four-color filter, for the first time in the industry, that adds the color Y (yellow) to the three colors of R (red), G (green), and B (blue). This combination expands the color gamut, faithfully rendering nearly all colors that can be discerned with the unaided human eye. Four-primary-color technology enables the display to reproduce colors that have been difficult to portray using conventional LCD displays, such as the golden yellow color of brass instruments. When combined with Sharp's 1080p X-Gen LCD panel, which incorporates UV2A Technology, the displays offer dramatic reduction in energy consumption compared to conventional fluorescent-backlight LCD TVs. Continuing Sharp's history of innovation and originality, the new AQUOS LEDs offer a stunning new contemporary design that pushes the envelope for flat-screen television artistry. At only 1.6-inches thin, the full-front panel glass (on the LE920 and LE820 series) extends to meet the slim border for a subtle edge that befits the elegance of a modern home theater. These advanced AQUOS LED LCD TVs also include Sharp's newest version of AQUOS Net, which delivers streaming video with Netflix®. AQUOS Net gives users instant access to customized Web-based content as well as AQUOS Advantage Live real-time customer support. The new AQUOS LED LCD TV product lines are all compliant with Energy Star® Version 4.0 standards which become effective in May 2010 and are equipped with Sharp's OPC function that automatically adjusts the unit's brightness based on the lighting of the room. The LE920 AQUOS LED LCD TV Series represents the flagship line of this new suite of AQUOS products, offering the pinnacle in image quality and connectivity. This Full-HD 1080p LCD TV Series, available in an industry-first 68-inch (LC-68LE920UN) screen class size, as well 60- (LC-60LE920UN) and 52-inch (LC-52LE920UN) screen class sizes (68 1/32", 60 1/32" and 52 1/32" diagonals respectively), combines Sharp's Full HD 1080p X-Gen LCD panel with its UltraBrilliant Edge-lit LED backlight to display vibrant colors and deep blacks. Additionally, this 1080p TV offers outstanding performance for fast-action imagery, employing AquoMotion 240, which virtually eliminates blur and artifacts on fast-moving video. Offering extreme flexibility, the LE920 Series includes a USB media player for digital video/music/photo enjoyment. Offering additional large-screen AQUOS LED LCD TV options, the LE820 and LE810 Series are available in 60- (LC-60LE820UN and LC-60LE810UN), 52- (LC-52LE820UN and LC-52LE810UN), 46- (LC-46LE820UN and LC-46LE810UN) and 40-inch (LC-40LE820UN and LC-40LE810UN) screen class sizes (60 1/32", 52 1/32", 45 63/64" and 40" diagonals respectively). Similar to the LE920 Series, these models combine Sharp's X-Gen LCD panel with an UltraBrilliant Edge-lit LED backlight. Sharp's proprietary Fine Motion Enhanced technology is included for 120 Hz Frame Rate Conversion, as well as fast response time (4 ms).